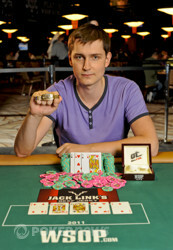 Viacheslav Zhukov captures the bracelet in Omaha. Those were the first words we've heard Viacheslav Zhukov speak in English all day, and they came just moments after he pulled the gold bracelet out of its box and hoisted it into the air. Photographers were clamoring for their shots, and Zhukov could barely muster a smile. Perhaps it'll be a bit later on tonight or tomorrow before the news that he's just won WSOP gold and $465,216 dollars sinks in. This fourth day (of the three-day event) began with our final three players battling it out for the bracelet. Steve Billirakis began the day on the short stack with just more than three big bets, and it wasn't but a few hands before he was escorted to the cashier's table in third place. The board ran out with George Lind and Viacheslav Zhukov checking it down the whole way. Zhukov bet the river finally, and Lind laid it down. Billirakis could only show for two pair, and it would get him nothing. Zhukov tabled , and his trip kings brought the match to heads-up. After such a short journey to two-handed today, one could be forgiven for expecting a quick resolution. The orbits came and went, though, with pots growing ever-larger to keep pace with the escalating betting limits. Many times over the course of the three-hour duel it looked as if the momentum had finally swung for good. Every time, though, the other player struck right back to square the match. Every pot, it seemed, had half the chips in play up for grabs. Finally, during the 32nd level of the event, when there were just 12 big bets in play, things finally unraveled all the way for Lind. It seems likely from his reactions that he was rivered in a big pot on a board that came . 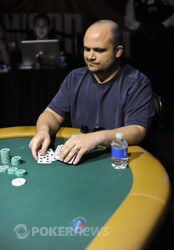 Lind check-called a flop bet, then led the turn and river. Zhukov popped it up to 1 million straight after the final bet, and Lind was forced to fold, leaving himself with just 1.4 million of the 6 million in play. On the final hand of the match, Lind got his money in ahead with just a pair of fours, but Zhukov's ran down the wheel on the board. It was the last hand of the day, and it was the one that gave the title to Zhukov. 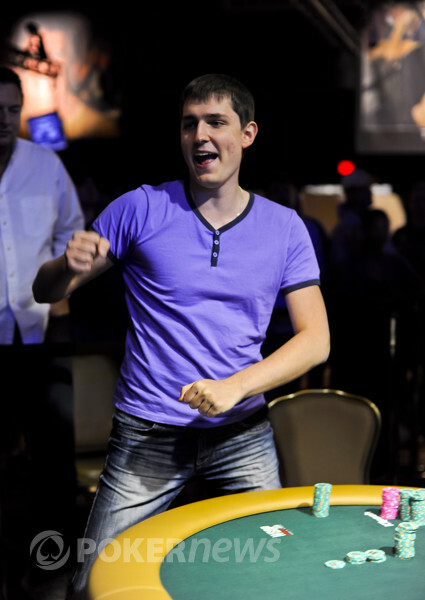 Zhukov now has two career cashes on his poker tournament stat sheet. The first was a win in an EPT side event, and the second is another title here today, a World Series of Poker title. He's the first Russian to win gold in 2011, and he seems a bit too tired to enjoy it fully right now. Perhaps in the morning. "I'm exhausted," he says. That's all for Event #11, but the Amazon Room is buzzing with action. Check out the coverage of Event #16, the $10,000 2-7 Draw event if you're craving some more Championship action. We'll see you over there! George Lind opened with the button, Viacheslav Zhukov put in two bets from the blinds, and Lind made the call. The dealer fanned , Zhukov led out, Lind raised, Zhukov re-raised all in, and Lind called. Somehow, Lind was in the lead with just a pair of fours, but there were plenty of cards that could help Zhukov. The rail enclosed upon the table as the dealer waited for the tournament director's command to deal the turn. "Ten of diamonds!" one of Zhukov's friends shouted. The turn was red, but the did not push Zhukov into the lead. It did give him flush and straight draws however - now any heart would give him the nut-flush and a deuce would give him the wheel. The crowd fell silent as the dealer rapped the table one last time before spiking the on the river. Zhukov leapt from his seat, showing emotion for the first time in four days of play as he went to celebrate with his friends. Lind stood from his seat and waited for an opportunity to shake Zhukov's hand before heading to the cage to collect $287,444 for his second place finish. Despite finishing runner-up, Lind deserves a ton of credit. He did everything he could at the final table to make it to heads-up play, but with just 12 big bets in play he could only do so much towards the end. Congratulations Mr. Lind, don't spend that quarter of a million dollars all in once place! Viacheslav Zhukov opened with a raise, and George Lind came along to the flop. It was , and Lind check-called a bet. On the turn, Lind took the lead with the big bet of 500,000, and Zhukov called before the completed the board. Lind took pause before leading out again, and Zhukov came over the top with a raise to one million straight. Lind clapped his chips together and let out a frustrated sigh, and he'd spend the next couple minutes in the tank. After some time, he waved the white flag and returned his cards to the muck, and the tides have turned in Zhukov's favor. He's got about 4.6 million now, while Lind falls to 1.4 million. George Lind raised with the button, Viacheslav Zhukov put in two bets from the big blind, and Lind called. The flop fell , Zhukov led out, and Lind raised. Zhukov called. The turn was the , and Zhukov slowed down, check-calling a bet from Lind. The river was the , Zhukov led out, Lind put him all in, and Zhukov called. Players are on a short bathroom break. Here's how the stacks look. George Lind raised the button, and Viacheslav Zhukov called to see a flop. It came , and Zhukov check-called a bet. The came on fourth street, both men checked, and the paired the board on the river. Zhukov checked again, and Lind made the final bet. His opponent spent a few long minutes considering, but he eventually mustered the gumption to call. Lind had for eights full, and it was good. He's got about 3.5 million now as the chip lead changes hands once again. George Lind raised with the button, Viacheslav Zhukov called in the big blind, and the flop came down . Zhukov check-called a bet, and the on the turn paired the board. Zhukov checked again, Lind bet again, but this time Zhukov check-raised. Lind called. The river was the , Zhukov led for the first time (leaving just 50,000 behind), and Lind folded. Zhukov now owns a slight chip lead with just over 3 million chips.